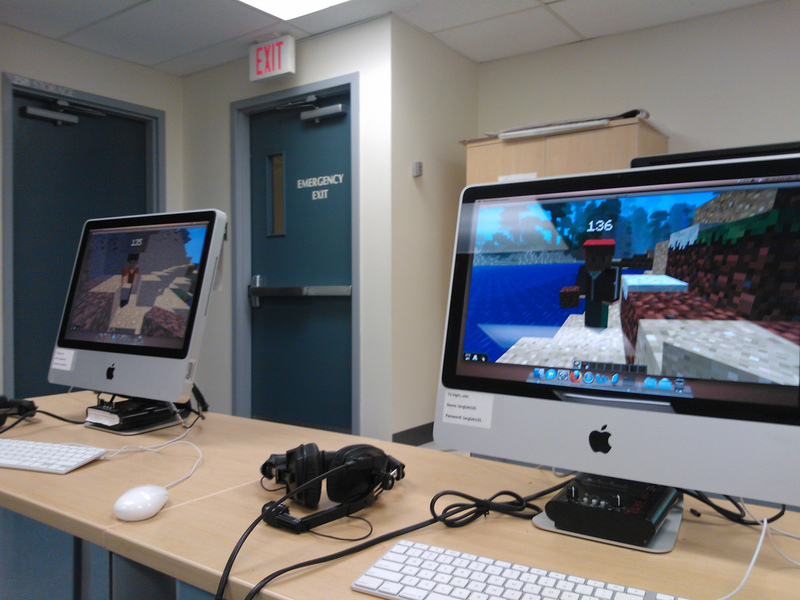 I hosted my first Open Minecraft Lab yesterday in Robertson Library at the University of PEI. Because one of the goals of the project is to spread word of our experiences, I’m documenting here some of the details of how we set things up, and how the day went. I’ll update this next week after we have our second session. Because there are a limited number of computers in the labs, it seemed wise to have people register in advance. There are 29 Macs in the Modern Language Lab and 20 PCs in the LINC lab next door; I set the capacity at 40 to account for extra people showing up, parents who wanted to play, and equipment failure. To manage the registration itself, I used Drupal 7 and the Node Registration module, a module that allows any type of Drupal content to have registrations attached to it. I set up a new “workshop” content type in Drupal, with a datetime field for the start and end of the registration, separate “registration starts” and “registration ends” fields, and a field for capacity, and then wired these fields up to the Node Registration settings. I then simply created a new “workshop” node for the April 20 Open Minecraft Lab, with a description of the event, and the dates and times and capacity set appropriately. The end effect was that a registration form was automatically attached to the node when it was published, and each time a registration was received the number of “available slots” was decremented by one so that when all 40 slots were filled registrations were closed. I originally didn’t allow more than one person per “registration”, but soon found that parents with more than one child wanted to register them both and hit the restriction of “one registration per email address” imposed by the module. To work around this, I modified the Workshop content type and the Node Registration settings to enable a drop-down list selection of 1 to 3 “slots” to be consumed by each registration. I didn’t anticipate the workshop filling up entirely, and didn’t realize that the registration form would disappear when it did, so I had language in the body of the workshop node that said “fill in the registration below” which people who encountered the node once registration closed found confounding (and resulted in 4 or 5 emails and a couple of voicemails). To solve this, I simply removed this language and added a bold, highlighted note to the form once registration was closed. Also to this end I built a Drupal View (Node Registration has excellent Views support) that displayed, one the front page of this website, the capacity and available slots for each lab. The first 25 slots filled up in about 24 hours; I was able to open up the second lab two days later and the remaining 15 slots filled up in another 24 hours and I continued to get requests for additional spots that I had to turn down. In the end almost everyone came, but there were about 8 PCs that went un-used, mostly because there was no hardware failure, and no parents choose to play, so I could have booked in more participants. 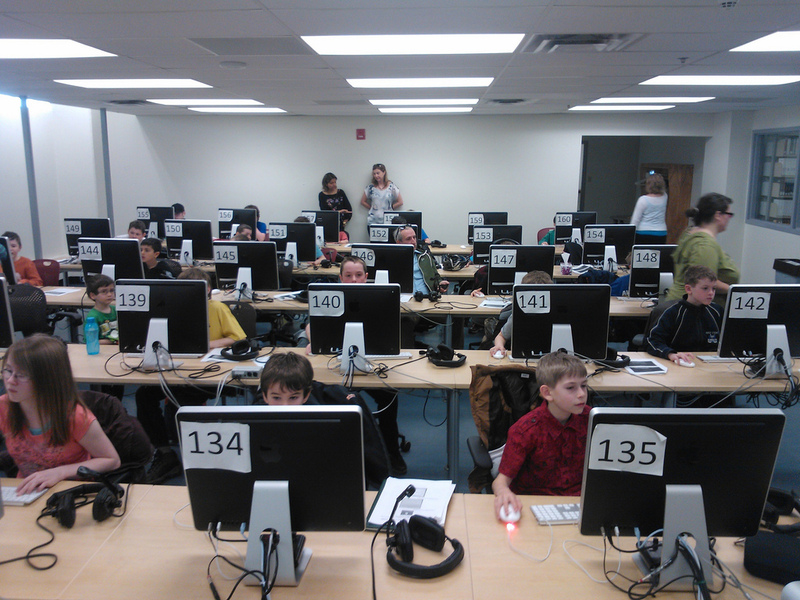 The age of the participants ranged from 6 to 15; the average age was 10. There were 3 girls and 37 boys registered. One of the things I wanted to stimulate was parents and guardians and their kids playing Minecraft together, or at least learning together. I also didn’t want to be solely responsible for wrangling 40 kids by myself, so I encouraged parents to stay and participate. What ended up happening was a mix: some parents and guardians left to go shopping or run errands, some sat beside their kids and watched or helped, some hung out in the lab, and some took advantage of the resources of Robertson Library. There turned out to be no “wrangling” issues at all: the participants were all great. I’d still like to get parents playing Minecraft, though. 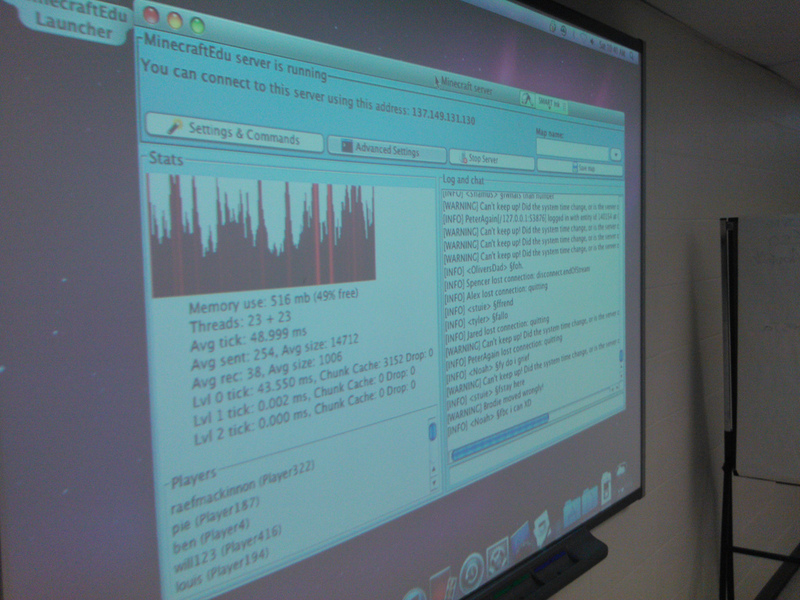 Robertson Library has a very good setup, hardware-wise, for hosting labs like this. The Modern Language Lab has 29 Macs with the username and password pasted on the front and home directories that reset on logout, meaning that people who login are free to do pretty much anything – install software, change settings, etc. – in a way that won’t adversely affect the next person to come along. Similarly, the PCs in the LINC lab next door allow for software installation and settings changes (although they’re a little more vulnerable because they don’t reset on logout, to any changes that are made are persistent). The Macs were clearly the better workstations: they’re newer, faster, have better screens, keyboards and mice and the Modern Language Lab is a much more pleasant space. The PCs are olders, grungier, have tiny screens, and seem as slow as molasses compared to the Macs. However Minecraft itself, once running, seemed to run equally well in either environment. The PCs were lacking headphones or speakers and were thus silent; the Macs, being in a language lab, each had a hefty headset and boom microphone: some of the participants used these, but most didn’t, either because they didn’t need sound, or because the headsets were too heavy or too large for their heads. I purchased the special education-focused “mod” of Minecraft called MinecraftEdu to run the Minecraft server on, and ran this on the instructor Mac in the Language Lab. Because this Mac is on the same LAN as all of the Macs and PCs in both labs, there were no networking issues to solve: all the workstations could “see” the server on the LAN. The Minecraft server software ran without issue on the Mac and, indeed, the Mac seemed capable of supporting both the server and the client at the same time. 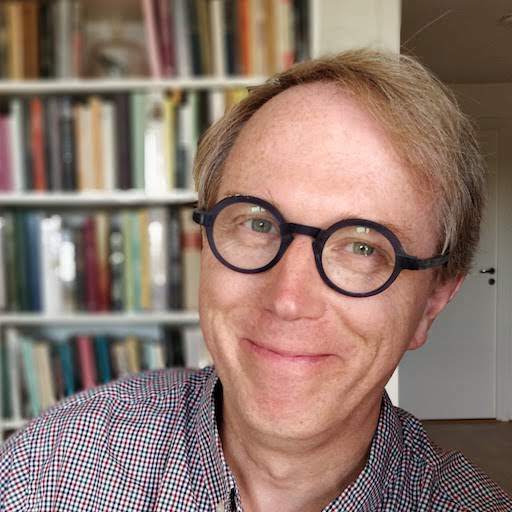 Indeed, several of the participants asked to be able to run their own server – to create a private world with a few friends, for example – and this proved problem-free. I also used the special MinecraftEdu client. Pre-installing this on all the workstations was going to be time-consuming, so I worked up a set of instructions for the Mac and PC, printed these out and put a copy in front of every workstation. For the Macs, I used Apple Remote Desktop, which was already installed on the instructor Mac. It’s an amazing piece of software that allows the instructor Mac to install software, copy files and observe and control workstations in the lab. The one limitation I found was that the workstations need to be logged in to be able to copy files, so I had to have each participant login, and then raise their hand so I could then copy the Minecraft client installer to their desktop. This worked well, but it slowed things down a little. For the PCs, I took advantage of a shared network drive accessible by all of the workstations on bootup: I put the Minecraft installer in that directory, and participants simply ran it from there. Most everyone was off and playing Minecraft within 10 minutes of arriving, and other than a copy of clients that crashed and a few that got their Minecraft controls reset, everything went well technically. In general, playing Minecraft requires having a Minecraft account, which costs $26.95 is is available for purchase online. The MinecraftEdu project offers educators discounted $18 accounts (sold as “gift codes” redeemable from Minecraft itself). Of the 40 registrations received, most already had a Minecraft account, and so I purchased 5 discounted accounts to distribute as needed. As it turned out, it’s possible to play the MinecraftEdu client in “offline” mode – good for situations where the clients are behind a restrictive firewall – and when this is done there is no prompting for a Minecraft account. To keep things simple, our instructions were tailored to running Minecraft in this mode; participants were welcome to login with their Minecraft accounts if they wanted to, but this wasn’t required. This discovery was positive as regards to prospect of running a Minecraft lab inside schools: as long as the MinecraftEdu server and client can be installed on workstations in a school, there should, in theory, be no need to deal with networking or firewall issues. I knew going into this experience that I knew next to nothing about Minecraft and that almost everyone attending would know more than me. That’s why I titled the event a “lab” and not a “workshop” or a “seminar” or a “camp.” The idea was that people could come and play Minecraft with each other, and in doing so they could learn from each other and I could learn from all of them. This is exactly how it worked out. When I got a question I couldn’t answer, I tried my best to hook up participants with questions with those that might have answers. There was a running chat inside Minecraft itself where I could see questions being asked and answered, and questions like “how do I stop flying” got shouted out and quickly answered. There were a couple of really helpful participants who took time out of their own gaming to help others, and that was a big help. I started off the Minecraft server in “survival” mode, but without monsters, which I figured provided a good challenge but less to fear for younger players; about 45 minutes into the lab I started to get requests to put the server into “creative” mode, and to avoid interrupting people mid-game, I installed a second server on one of the Macs in “creative” mode and those that wanted to play on it could just change the IP address of the server they were connected to. By the end of the day there were also two participants running their own servers on their Macs, either because they wanted things configured differently or because they wanted a private world to play with a select few others. Those running their own servers got to set a “teacher” password on start, which allow them to then experience the variety of special MinecraftEdu teacher-focused settings (being able to teleport others, being able to turn on and off game features, etc.). Griefing is a part of the Minecraft culture to the point where it has its own page in the Minecraft wiki where it’s described as “the act of irritating and angering people in video games through the use of destruction, construction, or social engineering.” I didn’t know the term until I started to hear it shouted out – “whoever’s griefing, please stop it!”. What was happening is that some kids were spending a lot of time building houses and buildings and other constructions, and others were going around blowing them up or smashing them (in hindsight this was partially my fault, as I enabled the “allow fire and TNT” setting in the server). At one point I was called upon to “do something about the griefers,” but opted not to, both because I had little idea exactly what I’d do (identify the griefers and ban them? ), and also because I didn’t cast myself in the role of managing the virtual environment: if the participants wanted to control griefing, they’d need to figure out a way of doing it themselves. As it turned out, the lab ended before this really came to a head, but I’m thinking about next week’s lab and possibly options: I might run a server with various anti-griefing mods applied, I might run two servers, one “free for all” and one more disciplined. Or I might just let it work itself out. My son Oliver helped the night before with setup and testing (part of the reason things went so well technically is that we tested all the instructions a couple of times and updated them as we encountered problems). Frances Squire, a grade 9 teacher from Birchwood Intermediate who is deeply engaged in technology education, was a great help, solving technical issues and helping to create an air of civility. And several parents jumped into the breach to help solve technical issues. The participants themselves were a great help to me and to each other, sharing what they knew and sharing what they learned. The vibe in the lab was generally helpful and open, and I think everyone came away feeling positive about the experience. Jerrad Gilbert, who provides technical support services for Robertson Library, was an invaluable help in guiding me through the ins and outs of the hardware and software setup in the labs; he was patient and helpful and I can’t imagine having pulled off the lab without him. And of course the “openness” of the labs themselves, which reflects an underlying openness of the library, made all of this possible: all PEI teachers should be exposed to the Modern Language Lab at UPEI to see what a well-resourced, progressively-managed educational computer lab looks like. We have another lab scheduled for next Saturday morning that’s already fully booked. I’ve asked whether it might be possible to open up an afternoon session for next week to allow for more registrations and I’m waiting to hear back. In general I’ll run things next week as I did this week, although I’d like to be able to take more time to observe and to play myself. Written April 21, 2013 at 9:37 a.m.